This official NASA history document - converted for accurate flowing-text e-book format reproduction - is a fascinating account by the former chief scientist of the Dryden Flight Research Center of the major space and aeronautical developments of the last 40 years, including the Space Shuttle, X-15, X-33, the lifting body program, the National Aerospace Plane (NASP), and other hypersonic research programs. Dr. Kenneth W. Iliff has been one of the world's foremost practitioners of flight research. Known internationally as the pioneer of parameter estimation. Iliff participated as a young engineer in the X-15 flights and contributed substantially to the famed lifting body programs. 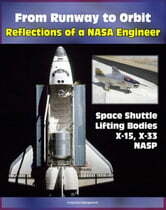 Dr. Iliff also worked for 25 years on the aerodynamics and flight characteristics of the Shuttle Orbiter. In this conversational and lively memoir, Kenneth Miff tells the personal story - which is also a national story - of finding a way to realize the dream of flying in the next dimension, direct from runway to orbit. The preface states: In his remarkable memoir Runway to Orbit, Dr. Kenneth W. Iliff - the recently retired chief Scientist of the NASA Dryden Flight Research Center - tells a highly personal, yet a highly persuasive account of the last forty years of American aeronautical research. His interpretation of events commands respect, because over these years he has played pivotal roles in many of the most important American aeronautics and spaceflight endeavors. Moreover, his narrative covers much of the second half of the first 100 years of flight, a centennial anniversary being celebrated this year. Dr. Iliff's story is one of immense contributions to the nation's repository of aerospace knowledge. He arrived at the then NASA Flight Research Center in 1962 as a young aeronautical engineer and quickly became involved in two of the seminal projects of modern flight, the X-15 and the lifting bodies. In the process, he pioneered (with Lawrence Taylor) the application of digital computing to the reduction of flight data, arriving at a method known as parameter estimation, now applied the world over. Parameter estimation not only enabled researchers to acquire stability and control derivatives from limited flight data, but in time allowed them to obtain a wide range of aerodynamic effects. Although subsequently involved in dozens of important projects. Dr. Iliff devoted much of his time and energy to hypersonic flight, embodied in the Shuttle orbiter (or as he refers to it, the world's fastest airplane). To him, each Shuttle flight, instrumented to obtain a variety of data, represents a research treasure trove, one that he has mined for years.